If you’re ever hitting the lanes at North Bowl and wondering why the folks next door are wearing suits and getting valet parking, the reason is Cescaphe Ballroom. 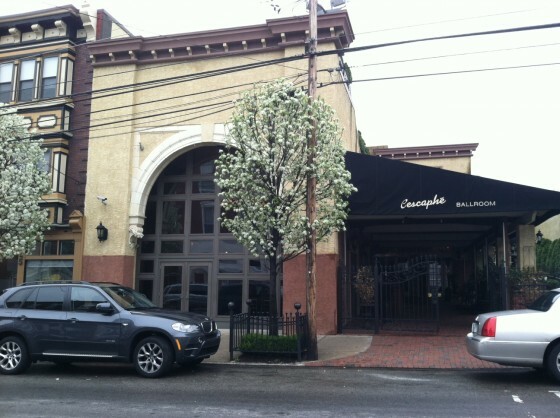 Located at 923 N. 2nd St., this Northern Liberties location has been drawing crowds for 200 years. As early as the turn of the 19th century, the Bull’s Head Tavern stood on this spot. In fact, quite a bit of important U.S. History would transpire just outside the tavern. According to The Library Company of Philadelphia, “in the year 1809, the staid citizens of Philadelphia were agog with curiosity over a strange and mysterious thing upon a vacant tract beside the Bull’s Head Tavern upon Second street, near Poplar street.” The ‘strange and mysterious thing’ was an exhibit for the plans to construct America’s first railroad. Below, a series of 1922 Frank H. Taylor sketches depicts the 1809 event. As shown in the illustrations above, the tavern also served as the Bull’s Head Hotel, the name by which the structure would come to be identified in the ensuing years. According to PhilaPlace, this stretch of North 2nd Street was a thriving corridor of residences, stores, taverns and inns. In particular, the hotels that lined this street were made as affordable lodging to people working in the mills and factories populating the area. As shown in the image below, taken from G.M. 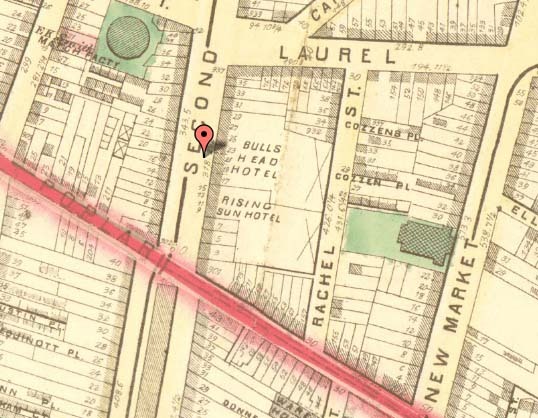 Hopkins’ 1875 Philadelphia Atlas, the Bull’s Head Hotel stands directly next to the Rising Sun Hotel. As you might have guessed, this is where North Bowl stands today. As the age of taverns wound to a close, the golden age of cinema was just beginning. Through the first half of the 20th century, Philly became home to hundreds of new projection theatres. The change would be reflected on North 2nd as well. 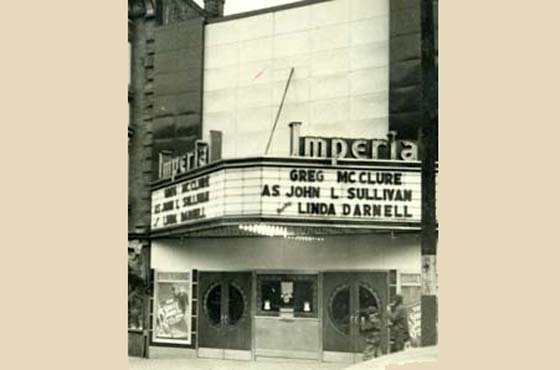 According to Cinema Treasures, the Imperial Theatre opened on this spot in 1923 with a seating capacity of 1040. The 1945 photo below, from Philadelphia Buildings, shows the Imperial Theatre in operation. By 1954, the Theatre had closed, making way for 50 years of relative anonymity for the structure. 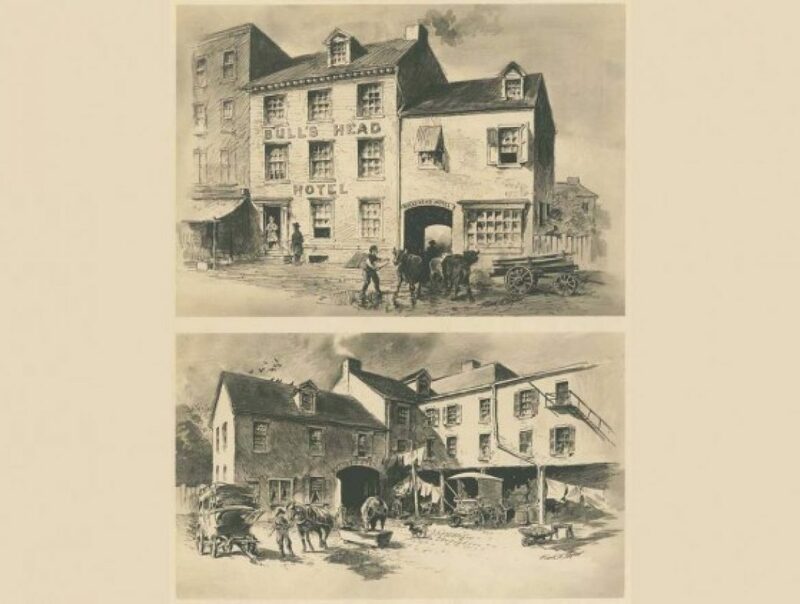 According to the book Northern Liberties: The Story of a Philadelphia River Ward, in the intervening time, the building was an office space for an exterminating company. In 2003 though, catering giant Joe Volpe transformed the building into the elegant and popular venue that stands today. 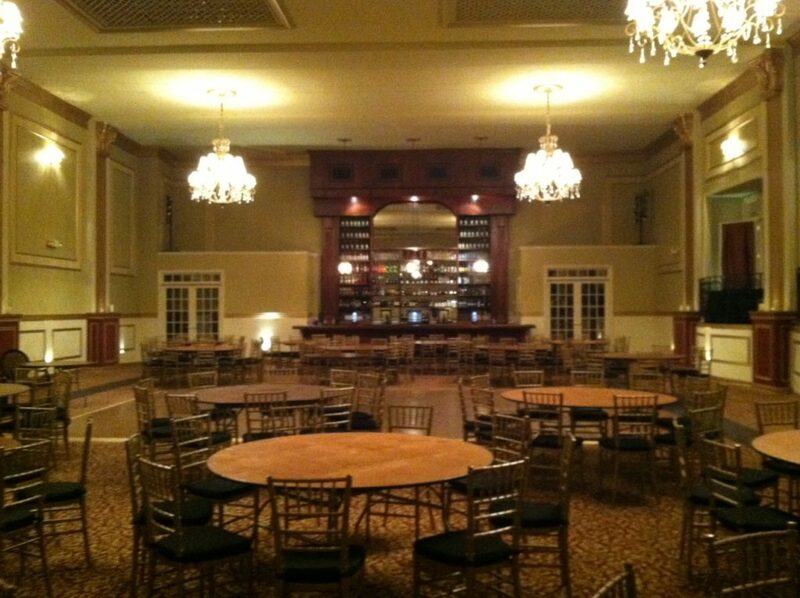 The exterior layout looks markedly similar to that of the Bull’s Head while the interior still bears some distinguishing features of its past, including an impressive floor to ceiling bar shaped unmistakably like a projection screen.